If you would like to get some healthy exercise and have a wonderful adventure, consider taking the Whiskeytown Waterfall Challenge. Visitors who complete the challenge will receive a free “I Walked the Falls” bandana (while supplies last). 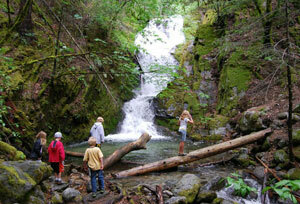 Whiskeytown has four major waterfalls that you can visit all year. The best time to visit the waterfalls is in the spring when the creeks are bursting with the runoff from melting snow. During the summer months a hike to a waterfall provides a cool break from the heat of the valley. Whiskeytown invites families, friends and children to get outside, get some good exercise and enjoy these special treasures of Whiskeytown. Click here to print your Waterfall Passport to take with you on your adventure. For over 40 years this 220-foot waterfall was only a secret to the few that knew it existed. For a variety of reasons, some people decided not to share the falls’ existence with others. Today, people from all over the world have heard about the hidden secret. Lower Crystal Creek Falls is the only “man-made” waterfall in the park. When the Central Valley Project was designed in the 1920s, an important component was the diversion of a large portion of the Trinity River to Whiskeytown Lake and from there to the Sacramento River. A 17-mile tunnel was excavated to transport the water underground from Trinity Dam to Carr Powerhouse and the tailings were dumped in the area near Crystal Creek Falls.